When you need an ultra-strong bed liner or protective coating for your truck or any other vehicle, the only place to turn is LINE-X of Omaha. We have decades of experience in the automotive industry, which means that we will always apply your bed liner correctly and that we will do everything we possibly can to ensure that you receive the best prices and the best possible customer service. LINE-X coatings are exceptionally tough and designed to help mitigate the normal wear and tear associated with hauling things in your truck’s bed. Applied to other surfaces, the LINE-X formula can prevent many different types of damage. 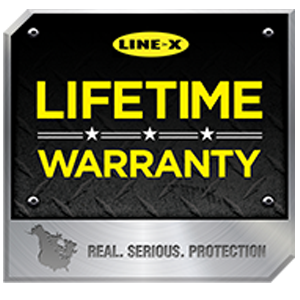 Best of all, LINE-X bed liners (when applied by trained and authorized expert technicians like the ones at LINE-X Omaha) are covered by a lifetime guarantee. Contact us today to learn more about LINE-X, to find out how we can outfit your truck with best truck accessories on the market, or for a quote. We look forward to helping you protect your truck as well as any other items or vehicles that need a little extra safeguarding from damage. We can help you protect your boats, trailers, ATVs, UTVs, golf carts, as well as industrial equipment. Basically, if you own it, we can apply LINE-X to it.